Rebecca Solomon (1832-1886). The Governess — "Ye too, the friendless, yet dependent, that find nor home nor lover. Sad imprisoned hearts, captive to the net of circumstance." — Martin Tupper. Exhibited: Royal Academy 1854. No. 425. 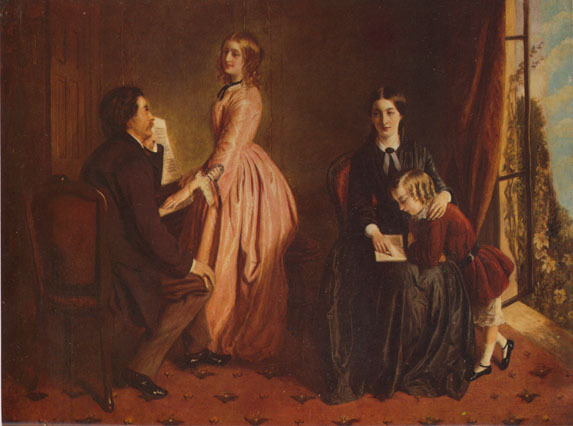 The Blessed Damozel: Women and Children in Victorian Art. London: Christopher Wood Gallery, 1980. No. 5. The Emergence of Jewish Artists in Nineteenth-Century Europe. Exhibition Catalogue. Ed. Susan Tumarkin Goodman. London: Merrell; New York: Jewish Museum, 2001.